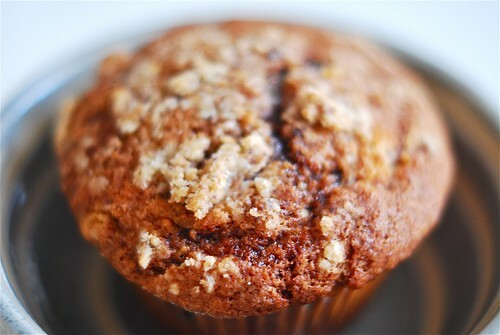 chocolate and banana muffin, originally uploaded by Lameen. I'm Making Harrisa Paste, originally uploaded by Lameen. Looks spicy hot, doesn't it ? Well ! it is. It's freezing where I'm not, Europe and USA and it's boiling where I am, Cape Town, so I think this post crosses the divide, keeping those who are cold warm and making those who are hot relish summer food with spicy barbecues and foods from the Orient. Wow ! what a mouthful, so here goes... the making of HARRISA PASTE (from scratch). The origin of this spice is usually attributed to northern Africa and most often Morocco. In summary, its a combination of garlic, olive oil and of course red chillies. I must confess, you can actually buy really good pre-made stuff from specialist shops, but as you know by now, nothing beats making your own from scratch and it couldn't be simpler, trust me. Leave your dried chillies in the hot water and pound together (in a pestle and mortar - the traditional way) the rest of the ingredients (except the olive oil) until a paste forms and the ingredients gel together. Now, add the wet red chillies to the rest of the ingredients and continue pounding but gently, as although the dried chillies would have soaked up most of the hot water, you don't ant to splash red stuff everywhere. Once you've mixed everything together add your olive oil, which should ideally cover the mixture. Your harrisa paste should last a few weeks in the fridge if you can't keep your hands off it and adding it to everything, even toast with cheese and harrisa. If you love couscous, you can add it to that too as well as use it to marinade chicken with a bit of yoghurt, oven baked and served with potatoes or couscous for a real Moroccan Fete. 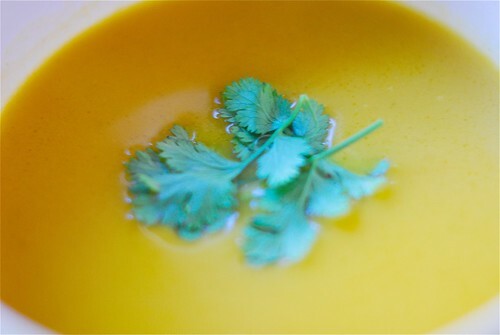 Pumpkin, Carrot & Chilli Soup, originally uploaded by Lameen. and place into a large pot and fry for about 5 mins on medium to high heat, so that the butter burns all over the ingredients. Then pour in 1 litre of vegetable stock (low sodium and no msg) into the pan and cook for about 5 minutes until it is bubbling and then turn the heat down. Add a handful of fresh coriander and continue cooking with a lid on for about another 10 minutes, by which time the vegetables should be soft. Pour the contents into a blender and pulse until completely smooth. Pour 1 tablespoon of extra virgin olive oil into the pot and then pour your pureed soup in. Cook for another 5 minutes and then it is ready to eat or drink. Top with fresh coriander, serve to the family, watch them look at you with suspicion, taste it and then fight to get some down your throat - just sharing my experience, BUT this was truly a tasty soup experience, which the whole family loved. Makes enough for a family of 4. New Age Prawn Avocado Salad, originally uploaded by Lameen. First up, an apology - I lost internet access and after that my hard drive crashed, just after 3 years of using it - urgghh ! So what do I have ? Two things - nothing - as all my foodie pics are gone (except the ones I share on Flickr like this), boohoo ! At least until I pay an astonishing $700 to recover the data. Second, not to worry, as I have a simple but tasty and quick recipe for you to enjoy if you like prawns of course. Spending some time at home, until my cafe opens, God willing, very soon, you get to wander around the house and kitchen thinking about making something quick and tasty for lunch. This is more so for me, when I've made a whole batch of mayonnaise and want to compliment it with something, so I thought why not a prawn, avocado and mayonnaise salad, but with a twist, like all good thriller movie endings. Put the stove on medium heat and place a large non-stick frying pan on it until very warm, then place your prawns into the frying pan, quickly followed by the butter. After about 1 minute, sprinkle your chiili flakes in, tossing the prawns around so that they are covered with the chillis. Quickly follow with your crushed garlic and fry until the prawns are cooked through - say about 4 minutes. If you are using frozen prawns - which would be most of us, then make sure they are completely defrosted. Remove the frying pan from the stove and slice up your avocado and place them onto a bed of washed and patted dry rucola leaves. 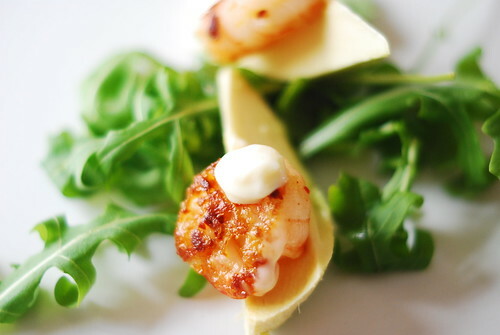 Top with your garlic and chilli prawns together with mayo and serve with some slices of ciabatta or baguette. Simple, isn't it ? To make more of a meal of it, place all the ingredients nicely into your baguette or ciabatta and have a, wait for it, "chilli and garlic prawn and avocado mayo salad sandwich" - what a mouthful.... of delicious decadence, enjoy. Inspired by a recipe by moi. Making Biscotti Catucci, originally uploaded by Lameen. Baking paper and one large flat oven baking sheet and oven on 180C. Beat the eggs and pour into a mixing bowl with the rest of the ingredients. Mix until everything is together and in a dough. Place your dough onto a floured board or a clean kitchen surface (if you're rich enough to have one of those Caesar stone or marble surfaces). Flatten and cut into three pieces - this will depend on how you want your biscuits to turn out - if you want them small like the ones above in the main pic, then rolling them out into three sausage shapes would be ideal. If you want them more traditional like an oblong shape, then two or if you like try one long flattened shape. Place your rolled out biscuit dough logs or log onto a greased baking sheet and bake for about 15-20 minutes, depending on your oven. Take them out, careful not to burn your fingers and using a very sharp knife, cut your dough into the biscuit size you want - ideally, 5 cm thickness is recommended. Once you've finished cutting your biscuits, place them neatly onto the same baking sheet to be baked again - you see, "twice baked". This stage is crucial because this is how you "dry" out the biscuits to make them harder. Don't get me wrong, they are quite nice "once" baked and are very similar to a sweet cake like biscuit. However, be careful at this stage as you don't want them too hard. I recommend no longer than 5-6 minutes on 180C. As soon as they get medium to dark brown, take them out and turn them over, so that the side on the baking sheet, which would have been exposed to more heat, will be facing upwards. After about 10 minutes, let them stand on their side, like below. As soon as they are cool, enjoy. If anyone tells you they are too hard, ignore them as I did with my kids, and then watch them scrabble to finish them within a few days before you even get to them - I share this with you from experience. Yes ! they are a bit hard, but as soon as you bite into them the delicious combination of the lemon zest, almonds and sugar will have you addicted as you try to control yourself to having just 2 or 3 or 4 per helping. In Italy, they are usually served with strong coffee and you can also serve them with hot chocolate as their relatively hard texture make them easy for dunking into your hot beverage. I'm Making.... Cape Gooseberry & Yellow Chilli Jam.. Yum ! So, last Saturday, after discovering a bit of the Cape Town environs, we got home a bit late and of course it was time for dinner. I knew that it was going to be spicy sausages with ........ Gulp ! I had some sourdough bread and some potatoes and thought, "I can't just serve sausages and potatoes with torn sourdough bread - that's very un-original. Looking into my fridge I saw the punnet of Cape Gooseberries I had bought the previous day and recalled how they had a very high pectin content - what's that ? Well ! I don't really know, but it's good for making jam. First up, put the stove on medium hot (if you have 6 dials, put it on 4) and place the medium sized pan on it. Place the gooseberries, the tomatoes and the 3 tablespoons of water into a blender and whizz until pureed. Put this into the pot and then add the sugar together with the rest of the ingredients (except the olive oil). Bring to the boil, as it will look very watery and then simmer for about 15 minutes until the mixture has reduced quite considerably and begin to looks like jam - now add the olive oil, together with about 3 tablespoons of water as you don't want it to be too thick. By looking at it, I knew it was ready, but you can always do the frozen saucer test if you want (in short, place a saucer in the freezer during the cooking time and to test the jam, place half a teaspoon onto the frozen saucer and push the jam a little with your finger, if there's an indentation, it is ready. To store, whilst the jam is hot, pour it into a sterilized jar and seal. Once it has cooled, about 2 hours, place in the fridge. 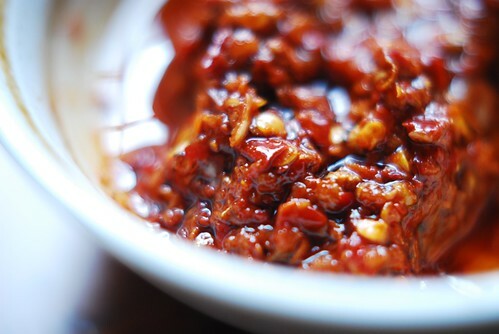 You can serve this type of jam warm with meats such as roast chicken or as I did with spicy sausages - trust me the contrast and the vast combination of tastes are really lovely - sweet, hot, salty and sour. The next day I had it as an accompaniment with French Brie in a baguette with lettuce. I was quite excited by this tasty experiment and if you can get hold of some gooseberries when in season (they are, here in Cape Town), then try it and enjoy ! 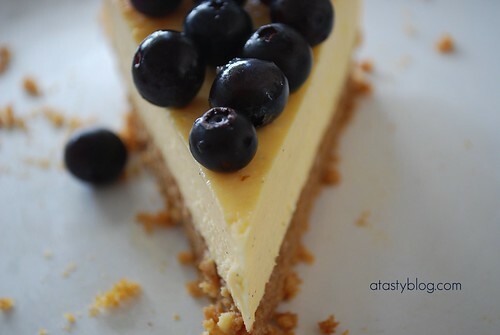 Blueberry Topped Cheesecake, originally uploaded by Lameen. In season down here in South Africa, blueberries are one of the "super foods" very high in antioxidants - the stuff that helps fight heart disease and cancer. So, is this a healthy cheesecake ? You decide, but I just wanted to share this pic and tip with you. Using my recipe for cheesecake (see post The Secrets of Making Cheesecake), I topped my cheesecake with a bit of maple syrup (also good for you) and some blueberries, just to cut through the cheesecake cake and give it a sharp and exciting mouth watering finish, YUM ! is all I can say for now. I just wanted to let you know that my A Tasty Calendar 2010 is now available to buy on www.zazzle.com/lameen. If you're strapped for cash, send the link to someone who isn't or just look over the images and let me know what you think. Have a good Friday. Using a food processor, mix the butter, flour and sugar together until it resembles crumbs and then pour the egg in until the mixture becomes one dough ball. Take out and knead for about 1 minute on a clean board. As pastry doesn't like heat prior to baking, place the dough ball inside a freezer bag or wrapped in cling film for at least 1 hour before you need to use it. You can also freeze it for months. When ready, put the oven on 180C, get your 4 mini non-stick tart tins out or your big 28cm tart tin (the standard size) and roll out the pastry appropriately. So, if using 4 tins, divide the dough into 4 balls and roll out flatly and fit snugly into the buttered tins. When ready, stab the bottom of the pastry with a fork about 6 times in different parts and then place a scrunched up baking paper on top of the pastry cases and fill with baking beans or uncooked rice or beans - you need to do this to weigh the pastry down so that it holds it's shape. If you don't, then the pastry will be flat. Don't trust recipes that say freeze and place straight into the oven - the heat will win. after all pastry is just sugar, butter and eggs (almost a cake). Bake the pastry for about 8 minutes on 180C, after which, you can remove the beans and baking paper and if you want the pastry a bit tougher, bake "blind" but not blindly, watch the pastry and I wouldn't advice more than another five minutes. The main advantage of this is that when you place your "wet" filling inside, it won't damp the pastry and make it wettish as you want crunchy pastry. I know it looks daunting, but it isn't, trust me and your efforts will be rewarded when you taste them. Divide the mixture equally between the tarts and bake on 180C for about 15 minutes. For the fig version, I placed 4 fig halves inside the tin. For the apple version, I sliced one apple very thinly and used them to cover the top of the tart. For the lemon curd version, I mixed two heaped dessert spoons of lemon curd with about 2 dessert spoon of the frangipane. Actually this was the tastiest of the lot. With the above recipe I was able to make 4 tart tins, two of which were apple based. you can serve the tarts with freshly whipped cream, preferably hot, but they are nice cold too. Isn't life full of surprises ? In my previous post I said figs are usually in season from about June (for Italian figs) until about end of October (for Turkish figs)and just last week as I was strolling through the Naschmarkt again, my eyes caught this lovely looking petite green figs, Bellissima Fici (Italian for "Beautiful or wonderful figs) Yes ! Small and sweet Italian figs, still in season in very late October. Cut the pastry to size and place on baking parchment/paper on top of a flat baking tray. Place the cheese pieces apart on the pastry slices and put each half of the fig on top. Put into the oven for between 10-15 minutes until the pastry is golden brown and the cheese has completely melted. Take out of the oven, let rest for 5 minutes and using a cake server or flat utensil, lift the tarts from the baking tray onto your serving plates. If you've got balsamic vinegar cream make a swirl on the tarts and finish with chilli flakes. You'll experience an amalgamation of tastes such as sweet (the figs), salty (the cheeses) hot (the chillis) and sour/sweet (the balsamic vinegar cream) Wow ! It's so quick to make this, that you can really impress your friends with it. To make more of a meal of it, serve with an Italian inspired salad, top the tarts with rucola (rocket or arugula leaves). Ideally, these tarts can be served as a starter around lunchtime. Hmmm ! I know it might sound strange to some of you not familiar with scrolling thousands of food magazines a year, but this is actually a very popular recipe in the food magazines and blogs that I read. Figs are also not that easy to come by and because they are very precious and highly seasonal, it is unlikely that you will get them out of season. I'm not a fig expert, but as far as I know there are many varieties, so I've heard of blue figs from Greece, in season from around September and I know of Giant Italian figs, in season around the summer months of June and July and finally I know of Turkish figs, in season between September and late October. So, the figs for this very simple recipe are Turkish, as in Vienna there's a strong Turkish community, it is easy and I'm glad to say relatively cheap to buy Turkish figs, because before I forget, fresh figs can be expensive if you don't hunt around in a good cheap local fruit market, so lucky me. From what I know, Turkish figs tend to be firm, with a tough purplish skin on the outside and very red in the inside - great for photos. So, because they are quite firm, they are actually the best ones for grilling, because some other figs can quite easily smudge in your hands if you don't handle them delicately. So for this easy recipe, which you can serve as a light dessert after a heavy meal, slice your figs in half and place in an oven proof dish, like a Le Creuset dish, if you can afford to buy one. As these figs are firm, they tend not to be very sweet either, so sprinkle each half with about half a spoon of sugar, brown is best as it will give it a caramel taste and if you have dark chocolate, grate some on to the figs too. I was lucky to use a vanilla pod, sugar crystal and chocolate bits grinder, bought in Cape Town at Melissa's. Grill the figs for about 10-12 minutes until the juices begin to run and the sugar has caramelized on the top. If your grill isn't working, which happened to me, then place the figs in the top oven on 250C for about 15-20 minutes. A Tasty Sweet Chilli Jam, originally uploaded by Lameen. Yummy!!! My wife wrote that. This is really easy to make and looks really impressive and of course tastes really "yummy". Just put 4 red chillies, 250g of cherry tomatoes (you can use normal tomatoes, but cherry ones are sweeter, have less water and cook quicker), 2 medium onions into a blender and blend. Place this red mixture into a wide saucepan with about 70ml vegetable oil and fry on medium heat for about 10 minutes - it will look quite light, like you are making a tomato sauce, but don't worry. After this, place about 50ml fish sauce and 100g caster sugar into the pan. It is important that you use a wide heavy based pan, because this will allow for more even cooking. Also, when you are making something with sugar in a pan, it is important that you keep stirring for at least 5 minutes so that the sugar is evenly distributed in the pan and doesn't catch the side and burn your saucepan. A little digression on tips, but keep the mixture cooking for about 20 minutes until it looks dark and caramelly (a new cook word) like in the picture above. As soon as it is ready, you can serve it with meat or with wok vegetables or as a dip with spring rolls. 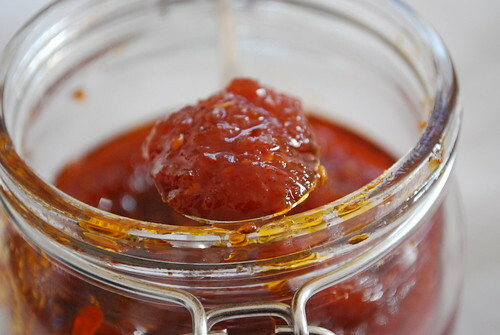 Unlike my tomato and chilli jam (recipe here), you can eat this as soon as it is done because it is more like a relish and sauce, which accompanies meals. This should keep in the fridge for at least 3 weeks, as long as you place it inside a previously sterilised jar (for this, just wash out a clean jar and pour boiling hot water inside and empty without burning your fingers). Modified quite a bit form a similar recipe in Bill Granger's "Feed Me Now"
Tasty isn't it ? So what is it ? If you are familiar with the foods of the Middle East, Greece and Turkey, then you might have come across this very sweet desserts made with all kinds of nuts, covered in filo pastry and drizzled with a combination of sugary syrup and honey. I can't tell you where they come from exactly, because in these 3 regions they've been arguing and I hope not fighting for centuries to claim it at as their own - the same goes for hummus - the famous chickpea dip, which I hope to share a simple recipe with you in the future, God willing. Ok, what about the food ? They are almost like delicacies because they are usually served and sold in small batches and because of what they are made off, expensive nuts like pistachios, topped with very time-consuming filo pastry - usually anything that takes time to make in a kitchen and is sold, costs a lot because they've got to pay the bills for the person who spent hours making just one stuff'. So, why I am making these expensive delectable fancies ? In short, because I like them and I am not rich. Just last week, I was rushing through the Naschmarkt in Vienna (Vienna's premier location for buying anything exotic related to food) with the kids, when I thought "let me spoil myself and buy some baklava". I noticed the lady in front of me cringe when she was told the price for what she had just bought and learnt from her mistake to go easy and just get 3 pieces - Price, wait for it ? €4 or $6 for my international readers. Ouch ! you may say, but I did mention they are delicacies. Something the rich spoil themselves with in the Middle East by buying trays of them to give as gifts. OK ! So I thought " I like this, but let me have a go at making them this weekend because I can't afford to buy more, at least in 2009". So I finally braved it and bought about 400g of filo pastry, which on looking through many cookbooks, has a special warning as being very delicate. Making my own is not an option as the weather can make or break your filo pastry. Oops ! For those not familiar with filo pastry, it is literally, pastry sheets, thinner than paper and almost see through. On Saturday I had used about 200g of it to make a Chickpea and fried rice filo pie - impressive ? Well ! it was for the kids and taste nice, but being a bit of a perfectionist and not having expensive camera equipment to shoot at night, I don't have any delicious pictures to share with you - sorry, but it was good and I hope to make it again. OK ! too many words, let's make this stuff. Start with the sugar syrup - yes ! I know you're saying not sugar syrup, but you need it, as there's no sugar involved in baking and trust me unsalted nuts covered in non-sugar pastry is going to taste about as bad as eating paper, without ink of course. Sugar syrup - 200g of caster sugar mixed with 150ml of water, juice from half a lemon and a dash of almond extract (optional). Put on the stove and bring to the boil so that it is bubbling for at least 5 minutes. Once cool, place in the fridge for about 2 hours. Place 300g of nuts (I used half pistachio and half blanched almonds - but walnuts are sometimes used) in a food processor and crush until medium fine - don't leave it too long until it becomes dust, but you want to see chunks. If you don't have a food processor, place the nuts in a bag, and crush with a rolling pin. After this, get your filo pastry ready, by taking out of the fridge and cutting it into chunks that will fit nicely into your 21 by 21 baking tin, lined with buttered foil. Melt about 70g of unsalted butter as you will need this to butter in between the filo sheets. To begin, place 2 to 3 sheets in the bottom of the tin, buttering each sheet and then place all the nuts on top. Just continue with the filo sheets, remembering to butter each sheet before you place another one on top of it. This should take about 5 minutes. After this, try and cut the pastry right through to the bottom of the pan, using a pizza slicer if you have one, or a sharp knife. If you can cut diagonally, try as it looks more impressive. Place in the oven on 180C for about 20 minutes until the top looks golden brown. As soon as you take it out, pour half the cold syrup all over the baklava, making sure it flows through each and every crack. Wait 5 more minutes and pour the rest of the syrup. Wait for about 10 minutes for it to soak right through, ensuring that the baklava is cool, if not, you'll burn your mouth with hot sugary nuts. Enjoy by its own - you don't ned anything else with this. Inspired by a recipe in Nigella Lawson's "How to be a domestic goddess"
Red and all things nice, apt for the summer, when you are flooded with strawberries and other berries. Sadly, I have to say that with the adverse weather conditions in Austria this summer, the normal 6-7 weeks of the strawberry seasons stretching from mid-May to end of June, lasted about one week, boo hoo ! However, our next door neighbour, Germany, seems to be churning out strawberries and in mid-summer, August, the supermarkets are now flooded with German strawberries. So, the other day, my wife came back with a 500g pack of very red strawberries and with weather conditions extremely humid and around 30 C, I thought perfect time to make one of my all time favourite summer Italian inspired delights, Sorbetto al fraglione (in English Strawberry Sorbet). You'll be glad to know that it is so easy and can be ready for dessert in a short time, provided of course you give some extra freezing time. Before you rush into the kitchen, I have to warn you that you'll ideally need an ice cream machine. It isn't 100% necessary, but it makes it a lot easier. First, you need to make a sugar syrup - yes ! that's right - for all those sugar haters - there's no way you can get away with freezing a fruit, except perhaps the sweetest sugary fruit (ready to eat apples), without adding sugar to it. If you don't, you'll end up throwing your attempt at sorbet down the drain, because it will taste like fruit with all the natural sweetness squeezed out, yuk ! After that "you need sugar syrup" lesson, what exactly do I mean ? Put about 70ml of water, 120g of caster sugar and lemon zest from one lemon into a saucepan ad cook on medium heat until the sugar dissolves - take it off the heat to cool - about 1 hour. After that, hull and cut about 300g of fresh strawberries into half sizes and place into a blender with the sugar syrup and lemon juice from one lemon until smooth. This should make about 500g/500ml of sorbet. Place the mixture into the fridge for further cooling. When you are ready, just put the mixture into your ice cream machine and churn for about 15-20 minutes and it is ready. However, I recommend put into the fridge for at least 30 minutes if you want to serve that same day. Otherwise, because sorbet has a lot of water in it, you should take it out at least 10 minutes before you want to serve it, as it will be too hard. Or if you are serving it after dinner to friends, place a generous scoop into a wine glass or an a small saucer, where the scoop should fit neatly into the dent usually reserved for the tea cup. If you don't have an ice cream machine, shame on you, go an buy one... just joking ! place the blended mixture into the freezer and check it after about 1 hour, let it get some heat, mix thoroughly to break any water crystals and place back into the freezer. If you prefer other fruit, use the same principle, i.e. 300 g of pineapple for example, which is what I did last year and was my calendar picture for July 2009 on my "tasty calendar", available on Zazzle. If you want to double the size, use about 200-250g of caster sugar and 130ml of water for the sugar syrup, using about 500-600g of fruit - this should make about 900ml of sorbet. Now, go and make yourself some sorbet and cool down on this fine hot day if you are blessed with hot weather. Last week a colleague asked for a chocolate cake for her son's birthday and I instantly thought "chocolate cake is always a hit with kids" so that was done. However, my dilemma was what sort of chocolate icing. I scanned through as many cook books and magazines as possible, but wasn't satisfied with what I saw and thought "I want it to be simple, but spreadable and thick", so here's my version of chocolate icing. keep stirring until the whole mixture emulsifies and is one, making sure there are no lumps so that the mixture is like silky chocolate soup - this should take no more than 5 minutes and you don't want the mixture to be anywhere near boiling as this will destroy the chocolate. Take of the heat and let it cool. When you want to spread it, make sure it is like soft butter, something that won't drip when you spread and something that won't be too hard that it will rip the cake. If you leave it out for about 1 hour (in winter) it will become hard again. But don't worry, just put the mixture back into a pan back onto low heat, stir until the mixture loosens again. If you are in a rush and forgot to make the icing on time for a cake to be eaten in an hour and it's summer, then let it cool for about 20 minutes and put it in the fridge, checking it about every 5 minutes until it is spreadable like butter. The icing should be enough to cover a 22cm sandwich cake, including the middle. I promise you in the not too far future, a recipe for chocolate sandwich cake.